When you configuring the password for a user in database, it automatically calculating the password hash normally or bypassing the hash process and writing a value to the PASSWORD column of sys.user$. When this user provides their credentials to Oracle to log in, Oracle will take the credentials, create the password hash, and then compare it with the value stored in SYS.USER$, find a match, and allow the user to connect. If we created the user and explicitly set the password value, things would be different. This time the value stored is the text string PASSWORD.This is an impossible password, because regardless of the input, the Oracle password hashing algorithm could never produce output that matches. Now you can not able to log in this user. Its called impossible password. Why it need for implement? If you would like to lock the user account, The attacker tries to login the these user account it shows the user account is locked , they may get a good information from this error. 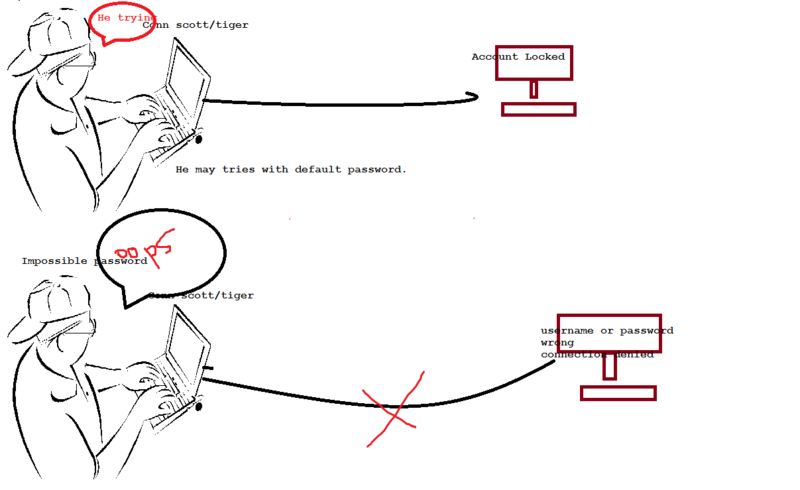 Locking default accounts tells an attacker what schemas and therefore what features are installed on a given database.This allows them to create a plan of attack before they ever penetrate the database, building a list of potential exploits with the benefit of knowing which potentially vulnerable features are installed. Furthermore, the attacker now knows the password for each account is set to the default value! Setting an impossible password and unlocking the accounts prevents an attacker from logging in, but also provides no information about the existence of each account/schema or their password. With impossible passwords, an attacker gets no information from an attempt to log in to the database with each default account and password. Less information is always better and it’s our responsibility to make a hacker’s job as difficult as possible. I’ve never used this method to lock accounts. Nice way to confuse attacker. really excellent azar. u’r are helping alot..
i have an error in rman while i’m running the rman command in linux. rman: error in while loading shared libraries:libclntsh.so.10.1: cannot open the shared object file:no such a file are directory. can u plz tell why this error is showing and to slove. Oracle seems to have broken this so you can’t set your password to non-hex values in 12.1.0.2. Is there a viable alternative for their new scheme?